As you move through middle age and begin to approach your senior years, it becomes clear that your physical strength, stamina and flexibility are not exactly what they used to be. Luckily, Paula Stephens, a wellness coach and personal trainer of PaulaStephensWellness.com, and Mike Clancy, a nutrition and fitness expert of MikeClancyTraining.com, have plenty of tips perfect for seniors looking to stay in shape. What are some of the specific benefits for seniors who decide to stay active and develop an exercise routine that suits their lifestyle? How can working out help seniors who are living with common age-related conditions like chronic back pain, arthritis or osteoporosis remain healthy? PS: One of the greatest benefits of exercise for seniors is that more and more research is showing active seniors maintain and improve cognitive function better than those who are sedentary. There is a significant decrease in dementia, depression and other mental health conditions when seniors engage in regular physical activity. Seniors who stay active and make exercise a priority have also shown a decrease in the incidence of heart disease - especially subsequent events for those who have already had one heart related incident and then go on to maintain a healthy lifestyle. Bone density, strength and flexibility are all maintained and increased through a proper exercise program. Seniors who are already dealing with common age-related conditions such as back pain or arthritis can better manage those conditions and minimize the use of prescription drugs by adhering to a consistent workout program three to five days a week. Exercise will also slow the progression of some of these issues. What are general precautions that seniors should keep in mind before deciding to commit to a workout plan? Is there an age where it is no longer safe to work out, or does it generally depend on someone's overall physical condition? MC: Before committing to a workout plan, seniors are encouraged to consult with their doctor. Exercise is a stress on the body (though the stress causes positive reactions). Seniors want to make sure they begin a workout routine at a slow, manageable pace that caters to their current physical conditions and activity level. It is best for seniors to first speak with doctor and consult with an exercise professional before beginning a regular workout routine. One of the beauties of exercise is that there is no age limit. 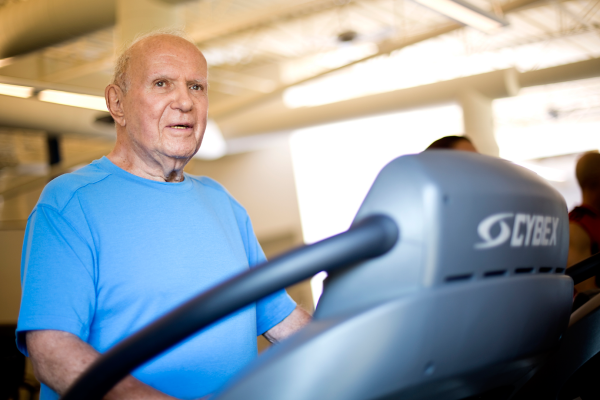 Many seniors take up regular exercise late in life and see measurable changes to their health and general well-being. Since exercise constantly improves our physical, emotional, and psychological states, working out is encouraged for everyone at any and every point of their lives. What are the ideal workouts for seniors who want to focus on keeping themselves healthy, managing their weight and boosting energy levels? Should there be a focus on cardio as well as weight training? PS: For everyone the ideal workout is the one you are mostly to stick to. Aerobic exercise such as walking, swimming, group fitness classes or biking will be the best for heart health and calorie burn to help with weight maintenance. Being sure to add activities that are weight bearing, such as walking, will help maintain bone density. Aerobic exercise will also boost mood and energy levels! Most importantly, do activities that you enjoy at an intensity that allows you to be slightly breathless, but able to carry on a conversation - a six to seven out of a one to 10 scale. For someone looking to do strength training, maintain good form and a safe weight load. If short on time work the bigger muscles of the legs, chest and back. MC: When exercising, machines tend to be a regular choice for seniors. Machines are great because they are designed to place the forces generated from the movement through the appropriate structures, joints and muscles. However, utilizing a varied amount of equipment, especially free weights such as dumbbells and barbells, will induce elements of stabilization, balance, and strength. It is important to adjust the equipment and tailor the workouts to each individual. There is no one-size-fits-all workout routine for seniors, or any persons for that matter.